Daimler, Linde and OMV Deutschland have opened a new hydrogen filling station in Metzingen as part of an ongoing cooperation. Grand opening of the hydrogen filling station in Metzingen. 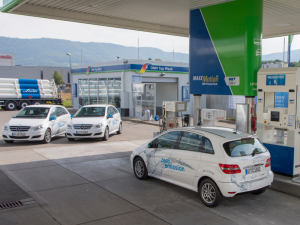 Co-funded by the Federal Ministry of Transport and Digital Infrastructure (BMVI) as part of its National Innovation Programme for Hydrogen and Fuel Cell Technology (NIP), the new hydrogen station is located at Auchtertstraße 19 in Metzingen. The new station forms part of the ongoing development of the nationwide infrastructure development which has seen 22 public hydrogen filling stations open already, eight of which are in Baden-Württemberg. It opens in advance of the start of production of Mercedes’ plug-in hybrid hydrogen fuel cell version of the GLC.